Last night we sent members a brief email with key points from the 2017-18 Budget. We’ve now delved deeper into the budget and have more detail on the measures relevant to SMSFs. The first obvious point to make is that this year’s budget does not contain any nasty surprises for SMSFs. That’s a relief after last year’s shocker. The budget contains an incentive for older Australians to downsize their homes, which may be attractive to some SMSF owners; but there’s less welcome news in the form of a new levy on bank deposits over $250,000 that may have a flow-on impact. From 1 July 2018, individuals over 65 will be able to make a non-concessional contribution of up to $300,000 to their superannuation from the proceeds of the sale of their principal place of residence which they have owned for more than 10 years. Typically, a couple will be able to top up their super by $600,000. The contribution can only be made to your untaxed pension account if you have a transfer balance of less than $1.6 million. If that’s the case, you can top up your unused cap space. Otherwise, the contribution goes into your taxed accumulation account. There’s no age limit (normally you can’t make contributions over 75) and no work test. 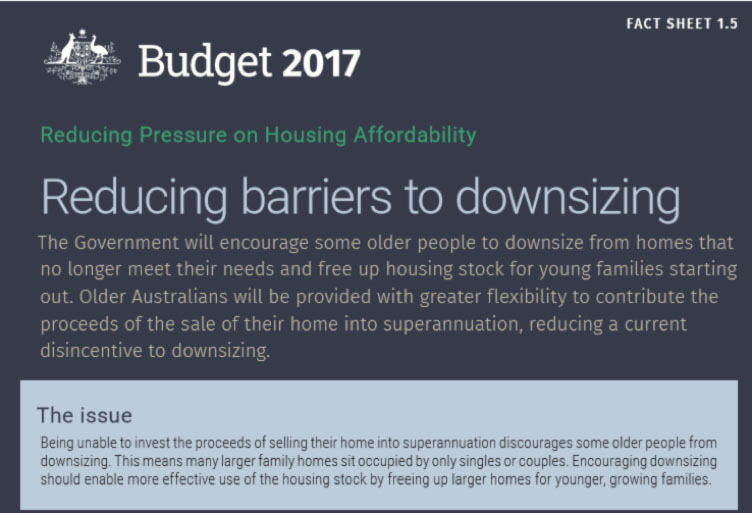 However, there’s very little information in the Budget about how the ‘downsizer’ incentive will work, including a definition of ‘downsizing’. We assume ‘downsizing’ will be a one-off option but this is not stated. Some general information is in the Treasury Fact Sheet at the end of this newsletter. The ‘downsizer’ option is an interesting move that may encourage some older people to sell their home and move to a smaller one though it may mean moving value from an untaxed asset (principal residence) to a taxed asset (accumulation account). There are also transaction costs (stamp duty and agent’s fees) to consider. It remains to be seen whether the incentive for downsizing will add to demand pressure on middle market housing as both downsizers and homebuyers compete for the same housing stock. This measure probably won’t be relevant to most SMSF owners. To help people save to put a deposit on a house, they will be able to contribute up to $15,000 a year and $30,000 as a concessional contribution to their superannuation fund. However, these savings must be within the existing $25,000 per year concessional contributions cap. This super earmarked for a house purchase can be withdrawn when members are ready to buy. Withdrawals will be taxed at marginal rates less 30%. It will mean more administrative work for the major funds. Perhaps the Government will now amend its objective of superannuation legislation to say the purpose of super is to “substitute and supplement the age pension…and help to buy a house”. Among a raft of measures aimed at the big banks, a levy on deposits that will raise $6.2 billion over four years is not particularly good news for SMSFs. This new cost to the banks will likely be met either through reduced profits and dividends or increased bank fees. Speculation that banks would be hit drove down their share prices yesterday ahead of the Budget from which they did not recover today. Typically, SMSFs are large holders of bank shares and some have sizeable deposits with the banks. The new levy will apply not only to deposits but also to similar products such as corporate bonds, commercial paper and certificates of deposits. The Budget says the new bank levy will not apply to deposits protected by guarantee, that is up to $250,000. The median SMSF deposit with banks is $293,000 so some will be affected. The average SMSF deposit is $105,000. There’s a new rule for SMSFs that borrow to purchase assets through limited recourse borrowing arrangements (LRBAs). “From 1 July 2017, the Government will improve the integrity of the superannuation system by including the use of limited recourse borrowing arrangements (LRBA) in a member’s total superannuation balance and transfer balance cap. Limited recourse borrowing arrangements can be used to circumvent contribution caps and effectively transfer growth in assets from the accumulation phase to the retirement phase that is not captured by the transfer balance cap. The outstanding balance of a LRBA will now be included in a member’s annual total superannuation balance and the repayment of the principal and interest of a LRBA from a member’s accumulation account will be a credit in the member’s transfer balance account. It is not clear exactly what mischief this measure is intended to prevent but the revenue leakage is evidently not significant as the Government expects to raise only $4 million over the next four years. But it will complicate matters for some of the minority of self-managed funds that borrow to invest in assets to grow their retirement savings, typically small business owners who buy the property from which they run their business. We recently expressed concern to Treasury about draft legislation giving effect to this measure because it means that gross rather than net (after interest) borrowings will be used in working out the $1.6 million balance caps. Practitioners tell us it may mean that some people relying on non-concessional contributions to help pay off their loan will not be able to do so if they exceed the $1.6 million caps when the gross value of their loan is counted. Another integrity measure in the Budget that makes more obvious sense is to prevent dealings between related parties on a non-commercial basis. For example, if business owners are renting premises from their super fund, it must be on a commercial basis. This measure to enforce the existing rules is expected to raise $10 million over four years. For the Fact Sheet explaining generally how the ‘downsizer’ incentive will work, see below. Save Our Super was formed in response to the Coalition Government’s superannuation tax increases and regulatory complications announced in the 2016 Budget. We have made extensive submissions on the Government’s regulatory package during its rushed consultation processes. Those submissions are available at the Save Our Super website, and the attachment to this letter draws on material from those submissions relevant to your Panel’s work. Since the formation of SOS, the interaction of the restrictions in the 2015 Budget on the age pension asset test with the restrictions in the 2016 Budget on superannuation have become clear. Although intended to make retirement income policy less costly, the interaction will instead likely cause retirement income policy to become unsustainable. This will necessitate more policy changes which will have to be carefully designed to rebuild trust and confidence in both the age pension and superannuation. A summary of our key points follow, with page references linking to the detailed explanation in the attachment. Until trust is re-established by adopting appropriate grandfathering principles, it is futile for the Government to load new incentives on to superannuation – for example to develop deferred income products, or to encourage savings towards first home ownership. If savers cannot trust existing legislated incentives which they have lawfully followed to build their life savings but are instead abused as tax minimisers and estate planners, why should they respond to new incentives which are equally open to be altered in future with effective retrospectivity? If you would find it useful, we are happy to meet with your Review Panel to discuss these issues further at your convenience. Save Our Super’s submissions to Treasury’s exposure drafts one, two and three of the legislation, and to the first of two inquiries by the Senate Economics Legislation Committee chronicle the absurdly rushed ‘consultation’ processes for all but the last of these five opportunities for comment. RIMGROUP is a cohort projection model of the Australian population, which starts with population and labour force models. The model tracks accumulation of superannuation, estimates non-superannuation savings and calculates pension payments and the generation of other retirement incomes (after taxes). Such modelling needs to be extended over decades to capture the lifetime impacts of changes in the super guarantee and changing super incentives and age pension rules. Click here for the Save Our Super submission to the Shepherd Review dated 12 May 2017. On 9 May 2017 Treasurer Scott Morrison delivered the Coalition Government’s 2017-18 Budget. We have set out below the three superannuation changes announced by the Treasurer. In Save Our Super’s opinion, the Coalition Government has undermined Australians’ trust in superannuation and created uncertainty by not providing appropriate grandfathering provisions in last year’s (2016-17) Budget changes. Therefore Save Our Super doubts there will be a substantial take-up of the Proceeds of Downsizing to Superannuation Scheme and/or the First Home Super Saver Scheme, when Australians realize there is no certainty that their superannuation savings are safe from future Governments’ adverse changes. The Government will allow a person aged 65 or over to make a non‑concessional contribution of up to $300,000 from the proceeds of selling their home from 1 July 2018. 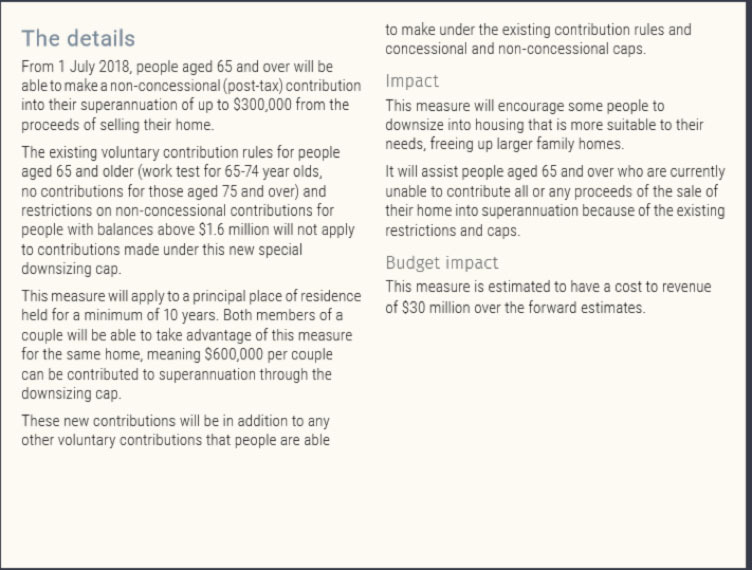 These contributions will be in addition to those currently permitted under existing rules and caps and they will be exempt from the existing age test, work test and the $1.6 million balance test for making non‑concessional contributions. The Government will encourage home ownership by allowing future voluntary contributions to superannuation made by first home buyers from 1 July 2017 to be withdrawn for a first home deposit, along with associated deemed earnings. Concessional contributions and earnings that are withdrawn will be taxed at marginal rates less a 30 per cent offset. Combined with the existing concessional tax treatment of contributions and earnings, this will provide an incentive that will enable first home buyers to build savings more quickly for a home deposit. This measure will ensure the 2016‑17 Superannuation Reform Package operates as intended and is estimated to have a gain to revenue of $4.0 million over the forward estimates period. We support The Shepherd Review’s Statement of National Challenges, and wish to offer some comments on how best to constrain the unsustainable growth of Commonwealth Government expenditure on the age pension. However, that account (which, to be fair, is a very common one) does not acknowledge the considerable move from reliance on the whole pension to the part pension, facilitated by the 2007 reforms to the pension and superannuation systems introduced in the Costello Simplified Superannuation package. That important progress is discussed at pages 3 and 4 below, and could be built on in reforms for the future, if recent retrograde changes can be undone. The challenge is to maintain the momentum of increasing super savings, so that over time those in a position to save more, move though part-pension/part-super retirement strategies to becoming completely self-reliant in retirement. Instead, the retirement income architecture created by the 2017 changes to pensions and superannuation is inherently unstable and unsustainable. Many savers are now locked in by perverse policy incentives to continued reliance on a part pension, and additional super saving is penalised. Trust in superannuation has been seriously damaged, together with a destruction of trust in how the retirement income rules will be further changed in future. The retirement income system should facilitate Australians’ legitimate aspirations to build higher living standards for themselves in retirement. General community living standards are rising over time. Australians are living longer with more years of active, healthy retirement. People are financially more capable of saving for their own retirement than ever before. The population structure is ageing, and consequently the largest ‘unfunded defined benefit scheme’ of all, the age pension, will require higher public expenditure from taxes bearing on proportionately fewer working age Australians. The income tax system – a progressive tax on nominal income – and the availability of the age pension continue to constitute large disincentives to long-term saving. Reducing the tax and pension disincentives to saving will both increase savings and efficiently allocate them through capital markets to the highest value investments. In contrast, reliance on a government age pension, even a policy which locks in an enduring reliance on a part-pension, necessitates ever-higher tax revenues, with all the dead-weight costs of taxation. In the case of the age pension, the restrictions announced by Treasurer Hockey in the 2015-16 Budget that took effect on 1 January 2017 reverse the more gradual pension taper introduced from September 2007 by Treasurer Costello as part of the 2006 – 2007 Simplified Superannuation package. That package was the system that pensioners now aged in their seventies and eighties based their savings and retirement decisions on. The assets test is very punitive as retirees must achieve a return of at least 7.8 per cent on their additional savings to overcome the effect of a reduction in their pension amount. This high withdrawal rate creates a disincentive to save or build retirement savings. …. It is proposed that the pension assets test taper rate be halved from 20 September 2007 so that recipients only lose $1.50 per fortnight (rather than $3) for every $1,000 of assets above the relevant threshold. This would mean that retirees would need to achieve a return of 3.9 per cent on their additional assets before they are better off in net income terms — that is, after taking account of the withdrawal of the age pension. ….. The reduction in the assets test taper rate would increase incentives for workforce participation and saving especially for those people nearing retirement who will still depend on the age pension to fund part of their retirement. So the gentler asset test taper introduced in 2007 was consciously conceived as a pro-saving measure, assisting the growth of retirement income levels by encouraging those who might have had to rely on just a full age pension to instead achieve higher living standards from a combination of a part age pension supplemented by savings in a simplified superannuation system. The gentler taper in the post-2007 pension asset test ensured that effective marginal tax rates on saving were not excessive, and offered savers perceptible gains in retirement living standards from their lifetime saving efforts. The simplification exercise was carefully researched, meticulously documented and explained in an extensive discussion paper; open to lengthy and meaningful community consultation; subjected to extensive published modelling of long term effects on pensions, retirement income and government expenditures and tax expenditures; and realistically costed. Those are all virtues lacking from the 2017 pension and super changes. …. as an exercise in policy leadership, the superannuation reform is as good as anything I’ve seen the department produce in the 20-odd years of my Treasury career. Unfortunately, the 2017 superannuation changes follow exactly the same path as the pension changes: i.e. they are the direct reversal of a previous incentive after peoples’ saving has been attracted and trapped within the super system. 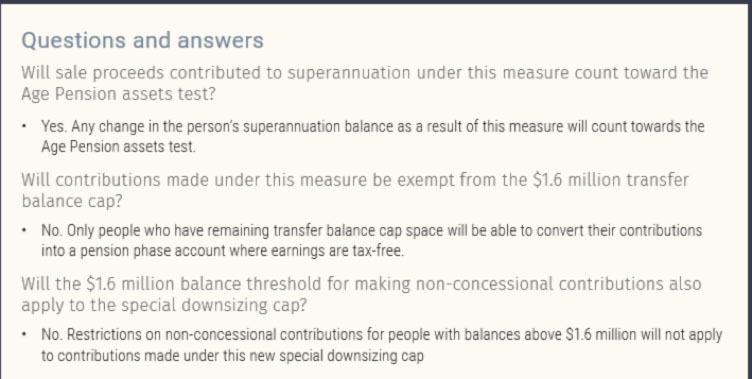 Treasurer Costello’s Simplified Superannuation concentrated super tax on the contribution and accumulation phase, but Treasurer Morrison reversed that by reintroducing both tax on the drawdown phase and massive complexity. The transfer balance cap paraphernalia comes with extremely complicated support structures of Personal Transfer Balance Caps, Transfer Balance Accounts, Total Superannuation Balance Rules, First Year Cap Spaces, Crystallised Reduction Amounts, Excess Transfer Balance Earnings and Excess Transfer Balance Taxes. The impacts of any pension and super changes have very long term effects, interactive with demographic and economic changes, and require detailed modelling to tease out the complex interdependencies over the long run. Since 1992, Treasury has maintained a specialized unit, now called the Retirement and Income Modelling Unit, to analyse tax, pension and super policy changes, and to assist distributional analysis and intergenerational modelling over the necessary multi-decade time frames. The modelling has used a large cohort model known as RIMGROUP. In 2012, Treasury updated modelling incorporating the 2007 Simplified Superannuation pension and super changes and other significant retirement policy changes up to 2012. Its key trends are shown in the chart on page 4. In summary, the modelling suggested the Simplified Superannuation pension and superannuation measures were performing exactly as intended to help reduce dependence on the full age pension and bolster saving to lift retirement living standards. 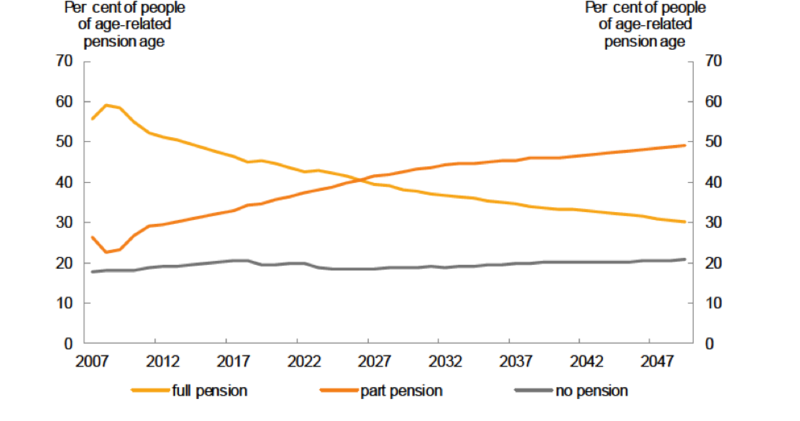 On policies applying in 2012 (including the scheduled increases in the Superannuation Guarantee Levy), Treasury projected that those dependent on the full pension would fall from about 50% of the age-eligible cohort in 2012 to only 30% over the years to 2050, while part-pensioners would correspondingly rise from about 30% to 50%. However only about 2-4% of those eligible by age for the pension would move to fully self-funded retirement, which would remain stubbornly low at about 22%. This is partly because as life expectancies continue to rise into the future, retirees would ultimately exhaust their super savings and would revert to part or full pensions in late old age. Source: Treasury RIMGROUP modelling, cited in Jeremy Cooper et al, A Super Charter: Fewer Changes, Better Outcomes, July 2013, p 13. It is of course possible to envisage even larger retirement living standard gains (or lower revenue costs) from better-tuned policies, as long as savers trust the rules for changing policies and maintain confidence in predictable access to their life savings in super or in access to the pension. ….. Australia is in a very strong position in relation to the sustainability of its retirement income arrangements compared with almost any other country in the world. However given the significant part of the government’s budget involved, the increasing costs as the population ages and the many factors influencing sustainability, this relative strength should not lead to complacency. Curiously for a Government presumably keen to demonstrate the virtues of its policy changes to the age pension and super in 2017, there has not been any more recent public release of RIMGROUP modelling to show the long-term effects of the 2017 measures. The higher pension taper is a large increase in effective marginal tax rates on part pensioners. While people in the workforce can often adjust to an increase in the marginal tax rate on their annual income by working more hours, seeking promotion, or training for a better paid job, those long retired have no such options. Higher effective marginal tax rates from a sharp asset test taper lock people in an extended income trap of dependency on a part pension and small savings, as enumerated in the charts on page 6. As the charts illustrate, over a wide range of lifetime super savings from $200,000 to $1,000,000, savers cannot lift their annual retirement income above about $50,000. Indeed, they go backward if they save more than about $340,000 but less than $1,000,000. Assumptions: 1. Married couple, both aged 65 or more; 2. Own home, debt free; 3. $50,000 personal use assets including car; no other assets; 4. Super saving pays eligible allocated pension at 5% pa, tax free. 5. Eligible super pension commenced after Dec 2014, so account balance deemed in Centrelink income test. In practice, this asset test trap over the $200,000 to $700,000 range is a very relevant problem, as the range of mean super balances now reported for males nearing retirement age is around the bottom of the flatline zone, but plausibly within reach of the ‘sweet spot’ where retirement income is maximized, as illustrated in the following table. 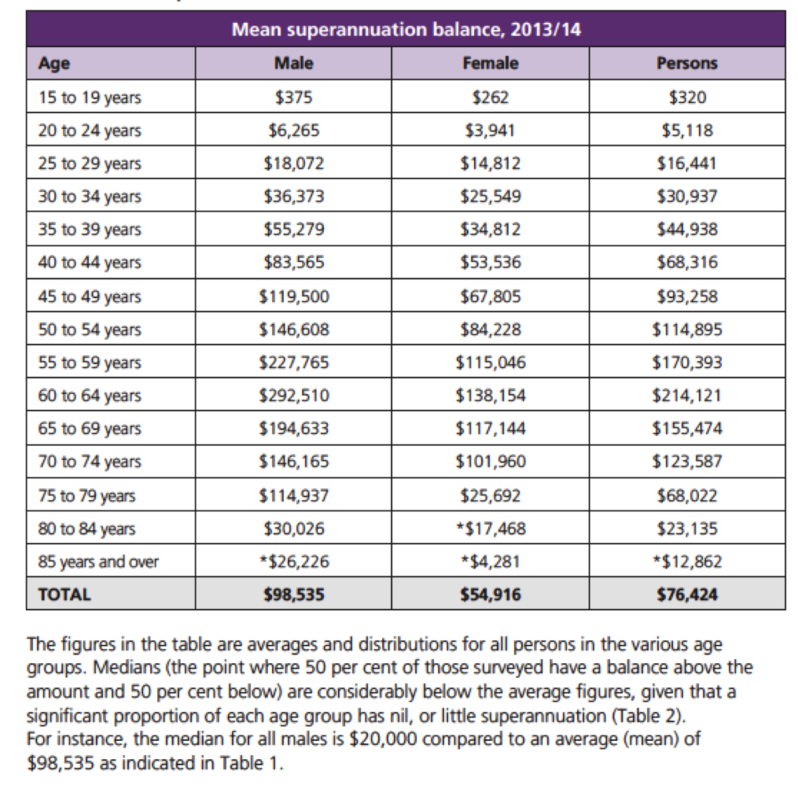 Source: Ross Clare, Superannuation account balances by age and gender, December 2015. …..a young person who starts work on an annual income of $50,000 and contributes $15,000 a year of additional super contributions from age 52 can now expect to have a lower income in retirement than someone starting work on $40,000 and doing the same. Corbett’s analysis shows a staggering rise in the rate at which the savings of middle-income younger workers will be clawed back: under the previous rules, a $300,000 increase in private savings would have generated about $200,000 in retirement income. Thanks to the change in the rules, almost half of that $200,000 increment will be offset by lower pension eligibility, implying an effective tax rate on retirement savings of close to 77 per cent. Given those tax rates, accumulating a substantial superannuation balance will hardly seem worth the sacrifice. Comparing, for example, two superannuants, one with a balance on retirement of $1.2 million and the other with $245,000, Corbett estimates that the 500 per cent difference in their accumulated savings will lead to a difference of just 20 per cent in retirement incomes. The 2015 restrictions by Treasurer Hockey on the age pension, which would by themselves have been onerous on present pensioners, now have their costs compounded by the 2016 restrictions on superannuation savings by Treasurer Morrison. Those trying to supplement their pension-based living standards through super saving, or trying to save enough to self-fund their retirement, feel themselves caught in a pincer movement. The severe part-pension taper restricts the net return on modest super savings. The restrictions on concessional and non-concessional super contributions and the obstructions of the transfer balance cap make it more difficult to break out of the income trap that encourages persistent reliance on the part pension. The lack of appropriate grandfathering surrounding the Hockey and Morrison measures is seen to be unjust. It is understood to be destructive of trust in super and pension rules, and very damaging to any future attempts to improve retirement income policy. The “rules about changing the rules” have been torn up. Now that the practice of grandfathering has apparently been abandoned by the Coalition, Labor and the Greens, it is dawning on all Australians that anything could happen in any future retirement income policy change, with ‘effectively retrospective’ impact. That is very damaging to policy reform for the future, and risks any intelligent discussion of options being shut down immediately by ‘scare campaigns’ which, on the last few years’ experience, may be well-founded. The Review’s forthcoming options paper on balancing the budget could play a vital role in rebuilding trust, and in putting revenue gains from policy change on a credible, supportable, sustainable, albeit slower-track approach. The Review could do this by advocating appropriate grandfathering provisions in relation to the 2017 super and pension measures. This would guarantee all who had made legitimate and lawful savings and retirement decisions on the rules that have prevailed over the last decade that their plans could last their lifetime, while new policy would take effect progressively for those who were given sufficient time to adapt to it. This is what Treasurers Keating and Costello did in the 1980s, 1990s and 2000s for all significantly adverse changes to super and pension conditions. The age pension qualifying age for those born after July 1952 will increase by six months to 65.5 in July 2017, as announced in the 2009-10 Budget. That Budget announced that the qualifying age will continue to rise gradually to 67 by 2023 for those born after 1 January 1957. Thus those nearing retirement were given between 8 and 14 years notice to maintain their employment, save for and plan their transition out of the workforce. In contrast, the Hockey pension changes significantly increases in the effective marginal tax rate on non-pension income in January 2017 (reversing the more generous Costello treatment introduced in 2007) were only announced in the 2015-16 Budget. So those already retired on the basis of the income and asset tests implemented through Parliament in 2007 had less than two years’ notice of a decrease in their living standards that they had no means to adjust to. And in further contrast, the Morrison super restrictions in the 2016 Budget upend late career savings plans, and the retirement living standards of those with savings or defined benefit pensions deemed to be above the transfer balance cap, with little more than one year’s notice. This changing practice looks perverse: slight changes adversely affecting those with relatively plentiful adjustment options were carefully signalled long in advance and grandfathered. Major changes significantly reducing the living standards of those who saved and retired on the basis of the 2007 Costello rules and now in their 70s and older were implemented in 2017 with practically immediate effect. The inclusion of grandfathering provisions would be fiscally responsible: emerging problems claimed to be structural products of pension and super rules would be fixed structurally, and with credibility because of wider community support in a gradual, fair, sustainable adjustment. Most importantly of all, any emergent retirement income policy problems or costs could be addressed open-mindedly, intelligently and in a spirit of goodwill, free of the pushback the Government’s approach has caused, and which will be even worse the next time someone raises a proposal for pension or super change. The retirement income architecture created by the 2017 changes to pensions and super is inherently unstable and unsustainable. Trust in the age pension and super saving have been seriously damaged, together with a destruction of trust in how the retirement income rules will be further changed in future. a displacement of saving effort outside the financial sector and into other tax-efficient savings vehicles such as the principal residence and its furnishings, negatively geared real estate, discretionary family trusts and so on. 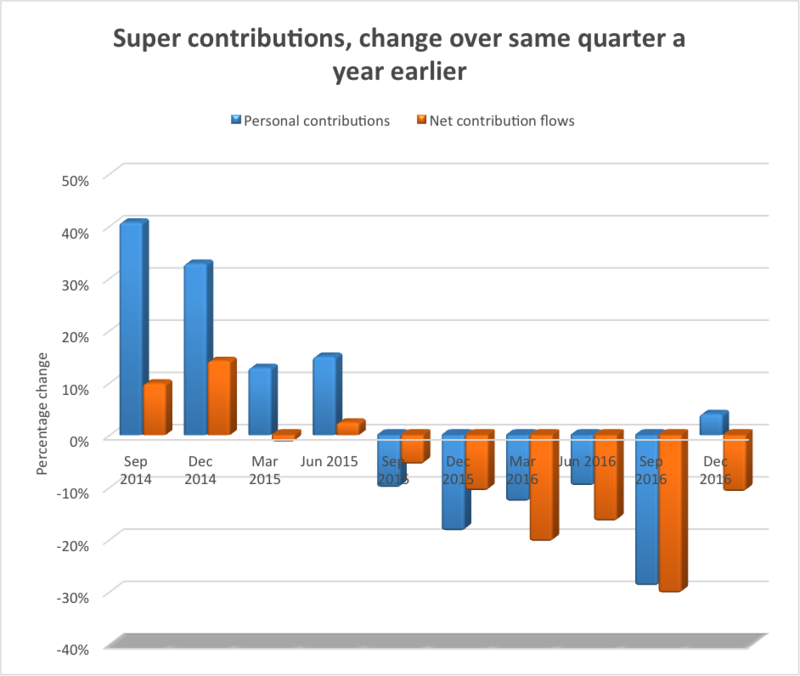 There are emerging signs of these adjustments in the APRA quarterly performance data on personal contributions and overall net contribution flows into super over recent quarters, shown in the chart on page 11. We can expect considerable turmoil in personal contributions over the next few quarters. For example, couples are likely to rearrange super balances from the high balance partner to the low balance partner in anticipation of the 1 July 2017 cut in concessional and non-concessional contributions. So data for the December quarter 2016, and the March and June Quarters 2017 will be turbulent. We expect that as the numbers settle down after the June quarter 2017, there will be much weaker personal contributions into super. As the evidence of this damage mounts, quarter by quarter, Parliament will soon have to repair the design flaws introduced by the 2015 Hockey Budget and the 2016 Morrison Budget. Most of the behavioural adjustment to pension and super changes occurs in the intersection between the pension and superannuation. Treasury modelling suggested many were moving from a full pension and low living standards to higher living standards from a part age pension supplemented by growing lifetime super balances arising from the Guarantee Levy and the Simplified Superannuation measures of 2007. This decline in the proportion of those age-eligible for the pension receiving a full pension, and the growth in the proportion receiving only a part pension were considerable but understated achievements of the previous pension and super regimes. We doubt that movement will continue under the 2017 policies. The reintroduction of a severe taper for the pension asset test close to average super balances will damage voluntary contributions to super, reduce overall saving effort and increase popular commitment to the ‘sweet spot’ strategy of saving no more than $340,000 and taking a part-pension. The incentive for those around the ‘sweet spot’ to move beyond that by more saving effort and becoming self-funded retirees has been severely damaged. The tighter restrictions on concessional and non-concessional contributions to super also hinder the opportunities to break out of the black hole of high effective marginal tax rates. To move from the optimum ‘sweet spot’ super balance to appreciably higher, self-funded retirement income would require more than doubling the super balance by more than $650,000. The lowering of the income cap for concessional contributions beyond which tax is imposed at 30% further hinders the accumulation of larger super balances. The Government’s new tax expenditures on super try to encourage those whose lower incomes mean they can’t save much (and perhaps nothing that they can afford to lock away for 40 years in super). What little additional saving does occur into small super balances is unlikely to relieve low-income savers’ dependence on the full age pension. Moreover, the effectiveness of the new incentives for the relatively poor has been damaged by the overall loss of trust in super and super law-making. The $1.6 million transfer balance cap and its extremely complicated support structures of Personal Transfer Balance Caps, Transfer Balance Accounts, Total Superannuation Balance Rules, First Year Cap Spaces, Crystallised Reduction Amounts, Excess Transfer Balance Earnings and Excess Transfer Balance Taxes, have directly discouraged high super balances, raised savers’ compliance costs, and increased super funds’ administrative costs. The latter higher costs will flow through to all super savers, further discouraging voluntary inflows into super funds. advocating the implementation of a new way of making better-considered retirement income policy changes. Jeremy Cooper’s 2013 report, A Super Charter: Fewer Changes, Better Outcomes, provides one model of a useful way forward. Peter Costello, A Plan to Simplify and Streamline Superannuation: Detailed Outline, Canberra, May 2006. Ken Henry, Treasury’s effectiveness in the current environment, Address to staff, 14 March 2007. See Section 5 of Save Our Super, Submission on Second Tranche of Superannuation Exposure Drafts, 10 October 2016. See Treasury website, Retirement Income Modelling. “Between age pension age and 70, the proportion without a pension will typically exceed 40% but with drawdown in retirement and successive cohorts living longer, the average over all ages is sticky at around 20 per cent.” See George P Rothman, Modelling the Sustainability of Australia’s Retirement Income System, Retirement and Intergenerational Modelling and Analysis Unit, Department of the Treasury, July 2012. Corbett’s work is reported by Henry Ergas, Who’ll pay for our long lives and pensions?, The Australian, 9 January 2017. Address to the SMSF 2016 National Conference, Adelaide, 18 February 2016 (emphasis added). See also Glenda Korporaal, Super shake-up hits fund flows, The Australian, 22 February 2017. See section 7 of Save our Super’s Submission to the Senate Economics Legislation Committee of 17 November 2016. Note: SuperGuide has invited advocacy group, Save Our Super, to highlight the immediate and long-term implications of the federal government’s latest changes to super and the Age Pension. The authors of this article, Jack Hammond QC, founder of Save Our Super, and Terrence (Terry) O’Brien, a retired Treasury official, have kindly shared their decades of combined expertise and experience in the legal, economic and policy areas. This article is based on a longer paper produced by Save Our Super, and the link to the Save Our Super website, and to the longer paper appears at the end of this article. For information on the specific super and Age Pension changes, see list of articles at end of this article. To build personal savings to a level that would support a self-financed retirement takes a working lifetime. Regrettably, the Coalition government has given Australia’s most comprehensive retirement income reforms just 10 years before reversing them. In 2007 a former Coalition government enacted the well-researched Simplified Superannuation reforms to improve retirement living standards, which was based on two central ideas: the introduction of tax-free super for most over-60s and a gentler taper rate on the Age Pension assets test. In changes taking effect in 2017, the current Coalition government completely reversed policy direction on the two central ideas of the 2007 reforms. Background on the 2007 reforms: Simplified Superannuation contained a series of radical Age Pension and superannuation reforms proposed in the May 2006 Budget, and detailed in an extensive discussion paper of the same name, open to consultation until August 2006. The reforms were legislated in slightly modified form and took effect mostly from 1 July 2007 (for superannuation) and 20 September 2007 (for the Age Pension). The full account is conveniently available at http://simplersuper.treasury.gov.au/documents/ . The package is sometimes referred to in later documentation as the ‘Better Super Reforms’. The reasons for the 2007 changes, the impacts of the poorly-tested 2017 changes, and the implications for the future of Australian retirement income policy are developed in a longer paper from which this summary is drawn. That paper is available on the Save Our Super website (see link at end of this article). The 2015 and 2016 Budgets separately (and perhaps accidentally) created, from 2017 onwards, incentives for a retirement strategy of maximising income by accessing a substantial Age Pension, supplemented by moderate superannuation savings. In the example we illustrate here, for a couple with their own home, lifetime savings should logically be self-limited to about $400,000 to maximise total income sourced from Age Pension entitlements and superannuation savings. The situation is illustrated in the charts below. Oddly, the optimum use of the Age Pension suggested by the Coalition government’s incentives will tend to drive people towards accessing about 94% of the full Age Pension. This tendency is signalled principally by ‘taxing’ superannuation income from savings between $400,000 and $800,000 at an effective marginal tax rate of over 150%. This financial impact results from doubling, in January 2017, the withdrawal rate in the Age Pension assets test back to its pre-2007 level (from losing $1.50 of Age Pension for every $1,000 of additional savings over the assets-free area, to losing $3.00 of Age Pension for every $1,000 of additional savings). Over the savings range of $400,000 to $800,000, doubling lifetime savings leads to about $11,000 less overall annual income. This is the same issue first reported (with slightly different estimates) by Tony Negline in ‘ Saving or slaving: find the sweet spot for super’, The Australian, 4 October 2016, and ‘Save more, get less: how the new super system discriminates’, The Australian, 26 November 2016. Only when superannuation savings rise to $1,050,000 is it possible to enjoy more income in retirement than from saving $400,000 and taking 94% of the full Age Pension. Further, key July 2017 superannuation changes — the unprecedented $1.6 million transfer balance cap, and the reductions in allowable concessional and non-concessional contributions — make it much harder to ‘save across’ the savings trap between $400,000 and $1,050,000. From 1 July 2017, would-be self-funded retirees have been caught in a pincer movement between the Age Pension changes and the superannuation changes. Those with super balances already in the ‘savings trap’ between $400,000 and $1,050,000 are, in effect, encouraged to spend the excess over $400,000 (for example on holidays, a more valuable house, or renovations) at no cost to their annual income. Instead, increased and sustained reliance on the Age Pension will make up the shortfall in superannuation income, and limit if not reverse the assumed short-term expenditure savings for the Coalition government. Whatever the short-term budget impacts, it is the long-term effects of these changed incentives on savings and work over a career spanning 40 or more years, and on pension dependence over a retirement spanning 30 or more years, that are the most important. The long-term effects of the 2017 super and Age Pension changes alter retirement living standards and fiscal sustainability through their effects on superannuation saving, workforce participation, retirement decisions and Age Pension uptake. For the 2007 reforms, Treasury’s special retirement income modelling group published a series of estimates (both at the time, and subsequently) of the long-term evolution of retirement living standards and superannuation and Age Pension usage using RIMGROUP, a comprehensive cohort projection model of the Australian population. Regrettably, there is no publicly available, official modelling of the 2017 system with the sufficiently long, 40-year horizon necessary to clarify whether the new system improves retirement living standards and fiscal sustainability or (as we argue) will very likely worsen them. Even without the necessary long-term modelling, it is clear that the rapid move that was underway from reliance by most on a full Age Pension towards supplementing a diminishing part Age Pension with increasing superannuation savings will now be greatly slowed or halted. Moreover, the Coalition government’s reversal of its own 2007 policies in just a decade (and without enacting appropriate grandfathering provisions relating to the previous rules) has seriously damaged confidence in both superannuation, as a repository for life savings, and in the Age Pension, as the safety net for those less able to save (for the authors’ analysis of why grandfathering is so important, see SuperGuide article, https://www.superguide.com.au/the-soapbox/super-changes-grandfathering-rules ). We argue that the incoherence and perverse incentives now at the heart of retirement income policy presage the need for further policy changes. The Age Pension and superannuation policies are now Budget-to-Budget propositions. Another consequence is that the ambitions of the Coalition government to load new tasks on to superannuation incentives, such as creating deferred income products or assisting saving for a first home, are likely to fail. If citizens can’t rely on the government to respect obligations to those who trusted their lifetime savings or retirement income to yesterday’s laws, why should they allocate additional savings for a decade or more hence on the basis of today’s laws? The 2016 Federal election saw Labor, Liberals and the Greens in a chaotic, ill-specified competition to raise more tax from superannuation, with no modelling of the long-term effects. Such a chaotic approach does not augur well for future policy making in this most complex policy area, where mistakes have long-lasting consequences and savers’ confidence is easily destroyed and very difficult to rebuild. The three charts below show how the Age Pension changes in the 2015 Budget (taking effect from January 2017) could be claimed by the government to save expenditure in the short run. But coupled with the superannuation changes in the 2016 Budget (taking effect from July 2017), they introduce instability and create long-term Budget costs that will likely render the changes unsustainable. The charts below are derived from a model created by Sean Corbett, B Comm (UQ), B A (Hons) in Economics (Cambridge), M A (Cambridge). Sean has more than 20 years of experience in the Australian superannuation industry, principally in the areas of product management and product development. He has worked at Challenger and Colonial Life, Connelly Temple (the second provider of allocated pensions in Australia) and Oasis Asset Management. The Corbett model captures the key interactions between the superannuation system and the Age Pension under its income and assets tests. It uses illustrative superannuation balances rising in $50,000 increments, and allows exploration of total incomes enjoyed with various superannuation balances by retirees who are either single or part of a couple, either with or without home ownership. It also allows estimates how long various superannuation balances will last in retirement. The Corbett model is archived and available on request from the authors, who thank Sean for his permission to draw on his work, and for his helpful comments on drafts of the longer paper cited above. Assumptions behind the model and the charts drawn from it are available in our longer paper (see link at the end of this article). Chart 1 below shows illustrative superannuation saving totals in 25 steps between $150,000 and $1,350,000 for a 65 year old couple who own their home. Charts 2 and 3 show the Age Pension available, the legislated minimum superannuation income drawdown and the total income corresponding to each of the 25 illustrative lifetime superannuation total balances appearing in Chart 1. Chart 2 shows the situation under the rules that applied from 2007 to 2016; while Chart 3 shows the situation under the Age Pension rules since 1 January 2017 and the superannuation rules after 1 July 2017. To focus comparison on the change in policy itself (rather than indexed changes in pension rates), both charts use pension values at September 2016. Further analysis follows the charts below. Is a steeper taper rate for the Age Pension assets test ‘fair’? The potential short-run expenditure savings from reverting to the pre-2007 Age Pension assets test taper rate (losing $3 of Age Pension for every $1,000 of savings) can be seen by comparing Chart 2 and Chart 3: Couples in cases 15 to 21 lose all part Age Pension entitlements under the 2017 Age Pension changes. Whether the potential short-term savings from introducing a harsher Age Pension assets test will eventuate is uncertain — it depends on behavioural responses to perverse incentives outlined below. The new 2017 rule has been defended as ‘fair’: why should a couple owning their own home and with $850,000 (case 15) or more in superannuation receive any part Age Pension, however small? In 2006 and 2007 the answer to that question was explained in Simplified Superannuation and is illustrated in Chart 3. To truncate the part Age Pension abruptly by case 14 produces a wide range of very high marginal effective tax rates of over 150%. This causes its own unfairness: as noted above, a couple could double their lifetime superannuation savings to $800,000 over the ‘sweet spot’ of $400,000, yet would have an annual retirement income of $11,000 less. A couple could save $650,000 more than the superannuation ‘sweet spot’ and get barely any more annual income. We suggest few would consider those fair outcomes. Dissipating savings in the short run; limiting saving in the long run. In the short run, those with superannuation savings already above the ‘sweet spot’ will be induced to spend those savings, increasing the part Age Pension they can claim. Over time, this savings trap is likely to produce a heavy focus on ‘Age Pension first’ retirement strategies, aiming at the ‘sweet spot’ which yields 94% of the full Age Pension, and supplemented by limiting savings caught under the Age Pension means test to $400,000. Any remaining extra savings will likely be placed beyond the assets test, for example into the principal residence and its renovation. These perverse incentives stemming from the January 2017 changes are in marked contrast to the Simplified Superannuation Age Pension rules that applied until the end of 2016. 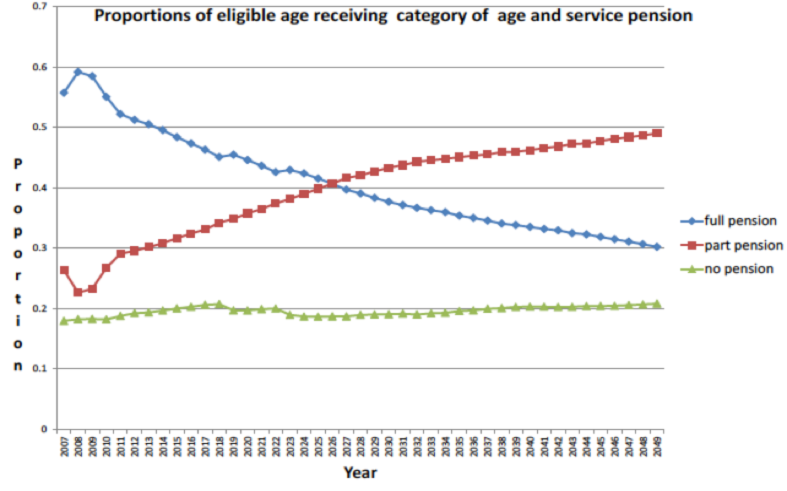 The key point shown in Chart 2 about those earlier rules is that for every $50,000 step up in super savings, the withdrawal rate of the part Age Pension was deliberately calibrated to ensure the saver received some increase in combined income from super savings and the remaining part Age Pension. There was no disincentive to save more, nor any incentive to dissipate existing savings in order to draw a larger Age Pension. The effective marginal tax rate on the income from additional superannuation saving between $400,000 and $1,150,000 was almost 80% — obviously very high — but an inevitable compromise in moving from full to no Age Pension without continuing fiscally costly access to the part Age Pension at excessively high income levels. When a future government is forced to correct the mistaken 2017 changes in retirement income policy, it will first have to rebuild public confidence in rule-making for the Age Pension and superannuation system. A future government will have to offer a clear strategic vision for sustainable change, and demonstrate the long-term consequences of proposed change for both better retirement outcomes, and more sustainable Federal Budget outcomes. Such an approach will require published, contestable long-term modelling. It will have to consult meaningfully and assure savers and retirees that any future, significantly adverse changes that may be necessary, will include appropriate grandfathering provisions. All these approaches have been used successfully in the past, but were abandoned for the changes taking effect in 2017. This article is based on a longer paper produced by the authors for Save Our Super. Click here to access the longer paper on the Save Our Super website. For more information on the author’s views about appropriate grandfathering, see SuperGuide article https://www.superguide.com.au/the-soapbox/super-changes-grandfathering-rules For more information on the specific super and Age Pension changes, see list of articles at end of this article. 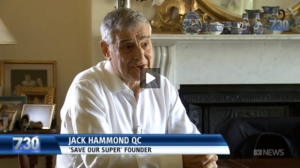 Jack Hammond: Save Our Super’s founder is Jack Hammond QC, a Victorian barrister for more than three decades. Prior to becoming a barrister, he was an Adviser to Prime Minister Malcolm Fraser, and an Associate to Justice Brennan, then of the Federal Court of Australia. Before that he served as a Councillor on the Malvern City Council (now Stonnington City Council) in Melbourne. During his time at the Victorian Bar, Jack became the inaugural President of the Melbourne community town planning group, Save Our Suburbs. Terrence O’Brien: Terrence O’Brien is a retired senior Commonwealth public servant. He is an honours graduate in economics from the University of Queensland, and has a master of economics from the Australian National University. He worked from the early 1970s in many areas of the Treasury, including taxation policy, fiscal policy and international economic issues. His senior positions have included several years in the Office of National Assessments, as senior resident economic representative of Australia at the Organisation for Economic Cooperation and Development, as Alternate Executive Director on the Boards of the World Bank Group, and at the Productivity Commission. $1.6 million transfer balance pension cap Age Pension Concessional contributions cap Federal Budget and superannuation Guest articles Income tax Making superannuation contributions Non-concessional contributions cap Superannuation News Taking a super pensiontax-free super superannuation strategies. First published by SuperGuide on 26 June 2017. Why is retirement income policy so contested? What was Simplified Superannuation designed to do? How was Simplified Superannuation working? How will the 2017 Age Pension and superannuation changes work? Accumulating personal savings to a level sufficient to support a self-financed retirement takes a working lifetime. Regrettably, the Coalition government has given a sound policy framework just 10 years to deliver a result, before destroying it. In 2007 it enacted the well-researched Simplified Superannuation reforms to encourage workforce participation, build lifetime savings and improve retirement living standards, while reducing reliance on the Age Pension. Simplified Superannuation was built around two key ideas: softening the cut-off rate for the Age Pension assets test and delivering tax-free super drawdown for most over-60s. With effect from 2017, the Coalition government has completely reversed policy direction on those two central ideas of the 2007 reforms. The 2015 and 2016 Budgets separately (and perhaps accidentally) created, from 2017 onwards, incentives for a retirement strategy of maximising income from accessing a substantial, continuing Age Pension, supplemented by moderate superannuation saving. In the example we use in this article to illustrate these incentives, for a couple with their own home, lifetime savings should logically be self-limited to about $400,000. Oddly, the optimum use of the Age Pension suggested by the Coalition government’s incentives will tend to drive people towards accessing about 94% of the full Age Pension. This is signalled principally by ‘taxing’ superannuation income from savings between $400,000 and $800,000 at an effective marginal tax rate of over 150%. This results from doubling in January 2017 the reduction rate in the Age Pension assets test, back to its pre-2007 level. Over the asset range of $400,000 to $800,000, doubling lifetime savings leads to about $11,000 less overall income each year, due to the impact of the Age Pension assets test. Only when superannuation savings rise to $1,050,000 is it possible to enjoy more income in retirement than from saving $400,000 and taking 94% of the full Age Pension. But the July 2017 superannuation changes make it much harder to ‘save across’ the savings trap between $400,000 and $1,050,000. From 1 July 2017, would-be self-funded retirees have been caught in a pincer movement between the Age Pension changes and the superannuation changes. Those already with super balances in the ‘savings trap’ between $400,000 and $1,050,000 are in effect encouraged to spend the excess (for example on holidays, a more valuable house, or renovations), at no cost to their annual income: the Age Pension will make up the shortfall in superannuation income. Unlike for the 2007 system it replaced, there is no publicly available, official modelling of the 2017 superannuation and Age Pension changes with the sufficiently long, 40-year horizon necessary to clarify whether the new system improves retirement living standards and fiscal sustainability or (as we argue) will very likely worsen the. Even without the necessary long-term modelling, it is clear that the rapid transition that was underway from reliance by most on a full Age Pension towards more Australians supplementing a diminishing part Age Pension with increasing superannuation savings will now be greatly slowed or halted. Moreover, the Coalition government’s reversal of its own policies in just a decade (and without appropriately grandfathering the previous rules for those who had acted on them) has seriously damaged confidence in both superannuation as a repository for life savings, and in the Age Pension as the safety net for those less able to save. ((For an explanation of grandfathering, see our article in SuperGuide.) We argue that the incoherence and perverse incentives now at the heart of retirement income policy presage the need for further policy changes. Age Pension and superannuation policies are now Budget-to-Budget propositions. Another consequence is that government ambitions to load new tasks on to superannuation incentives, such as creating deferred income products or assisting saving for a first home, are likely to fail. If citizens can’t trust the government to respect obligations to those who trusted their lifetime savings or retirement income to yesterday’s laws, why should they allocate additional savings for a decade or more hence on the basis of today’s laws? The 2016 election saw Labor, Liberals and the Greens in a chaotic, ill-specified competition to raise more tax from superannuation, with no modelling of the long-term effects. This does not augur well for future policy making in this most complex policy area, where mistakes have long-lasting consequences and savers’ confidence is easily destroyed and very difficult to rebuild. When a future government is forced to correct the mistaken 2017 changes in retirement income policy, it will have to rebuild public confidence in rule-making for pensions and superannuation. It will have to offer a clear strategic vision for sustainable change and demonstrate the long-term consequences of proposed change for both better retirement outcomes, and more sustainable budget outcomes. This will require published, contestable long-term modelling. The government will have to consult meaningfully and assure savers and retirees that any future, significantly adverse changes that may be necessary will include appropriate grandfathering provisions. All these approaches have been used successfully in the past, but were abandoned for the changes taking effect in 2017. In just the decade since Simplified Superannuation was introduced in 2007, the reasons for the two key elements of its approach and the evidence behind the reforms seem to have been forgotten. Notwithstanding this careful research and development of Simplified Superannuation, its key ideas shaped Australians’ work, saving, and retirement decisions for just a decade before their reversal. The two key ideas were reversed, not on the basis of new evidence or better analysis, but with a mere inversion of rhetoric. For savers under the Howard and Costello government, following legislated incentives to self-funded retirement was a necessary adaptation to an ageing population, weak labour force participation of older workers, rising incomes and rising expectations for retirement living standards. 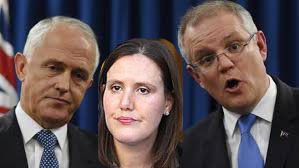 Now under Prime Minister Turnbull, Treasurer Morrison and Minister O’Dwyer, following those incentives has become “tax minimisation and estate planning”. As we shall see, discretionary saving balances high enough to yield retirement income above the Age Pension are now discouraged for many under the current Coalition government by extremely complex policy changes that penalise those who were saving, or had retired, on the basis of the policy of the previous Coalition government. 3. Why is retirement income policy so contested? First, the creation of the Commonwealth Age Pension in 1908. The Age Pension is a fabulous product: the ultimate unfunded, defined benefit payment. From the view of the recipient, it provides a modest but totally secure retirement, with no risk to income from economic recession or interest rate falls, no inflation risk (because indexed), and no ‘longevity risk’ of outliving the retiree’s savings. Moreover, it enjoys a high and demographically enhanced degree of protection from political meddling almost as great as provided by the family home, and more protected than superannuation or negatively-geared investment property (to compare the Age Pension with just the three forms of saving least disadvantaged by income tax). The Age Pension’s actuarial value to a retired couple is estimated to be over $1 million. Its value is rising as life expectancy rises, and interest rates and equity returns remain low and particularly uncertain. The taxation and regulation of superannuation have to be tailored to offset these two major disadvantages of the tax bias against saving and the provision of an excellent competitive product ‘for free’; otherwise, there would be no long-term, superannuation-based saving locked away for retirement. For retirement income policy, the significance of the $1million-plus value of the Age Pension for a couple is impossible to overstate. If a modest retirement income worth $1 million or more and guaranteed for life is to be gifted to anyone who ‘passes’ an income or assets test which does not count the family home and makes reasonable allowance for other assets, then the incentive to save and take up the risks of self-financed retirement instead of the Age Pension is low. If self-financed retirement is to be viable, incentives have to be very carefully designed to avoid discouraging incremental saving, even as savings accumulate to high nominal amounts. To labour an obvious point, only relatively rich people will be able to amass lifetime savings to better the Age Pension. This is the conundrum at the heart of the retirement income policy debate. Many on the political left consider the provision of super incentives to ‘millionaires’ to be unfair, even though the median value of a Sydney house is now more than $1 million, as is the value of the Age Pension for a couple. In contrast, many on the political right regard too-easy access to the Age Pension as destructive to saving, and understand that Age Pension rules and superannuation incentives cannot be effective if they discourage saving by the very group who may be able to save more than the value of the Age Pension over the course of their working lives. The final practical complication in the debate over retirement income policy is that any adjustment of policy disadvantageous to existing retirees or those close to retirement has to deal with the uniquely long-lived nature of lifetime savings commitments and the 30 or 40 year horizons necessary for individuals to lay the foundation for self-funded retirement, as discussed in the outline by Save Our Super of principles for grandfathering in the May edition of SuperGuide. 4. What was Simplified Superannuation designed to do? The inaugural 2002 Intergenerational Report flagged worrisome trends in both Age Pension costs and the costs of the Commonwealth’s old superannuation schemes, which although already closed to new entrants, had accrued large unfunded employer liabilities. A central challenge for financing retirement income policy is increasing life expectancy. In Australia, as in many of the advanced economies, …. life ­expectancy has been increasing by 2.5 years per decade, three months per year, six hours per day. If these gains are projected, as has been done internationally for the Human Mortality Database, a Western European or American child born in 2007 and 10 years old today, has a 50% chance of still being alive around 2110, at an age of 103. Australian life expectancy projections are probably similar. Past projections of growth in life expectancy have all been exceeded by experience. Prior to the 1970s, the primary driver of Australian improvement was rising life expectancy at birth, which increased the number of people who reached retirement age. But since the 1970s, there has been marked growth in life expectancy at 65, increasing the average time spent in retirement by more than 6 years for women and nearly 7 years for men. Since 2012, more Australians die each year aged 100 or more than aged 1 or less. Faced with this ageing demographic, Treasurer Costello wanted to lift potential retirement livings standards while reducing the heavy reliance on the Age Pension. The objectives of changing pension arrangements and reducing taxation on savings for retirement were to….sweep away the current tax complexities faced by retirees; improve retirement incomes; give greater flexibility over how superannuation savings can be drawn down; and improve incentives to work and save. The Howard/Costello government understood the need to move early but gently, so that changes did not disadvantage present retirees, but gave younger generations the time and opportunity to build the retirement living standards that they preferred and for which they were prepared to work and save. income stream such as a pension, would be tax free for people aged 60 and over.– Benefits paid from an untaxed scheme (mainly affecting public servants) would still be taxed, although at a lower rate than they are now for people aged 60 and over. (p 3) One measure of the degree of simplification achieved by Simplified Superannuation in 2007 is that its measures:cut the number of pages of superannuation law in the income tax assessment Acts by over a third. The interaction of these two ideas was a slow phasing out of access to the part Age Pension as savers’ means-testable, non-housing assets (especially superannuation balances) grew. 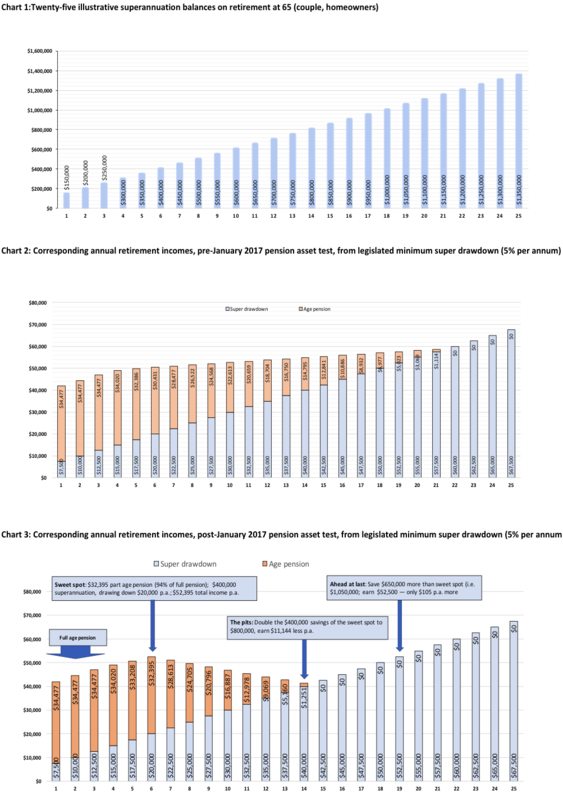 Charts 1 and 2 are drawn from a model of the Age Pension’s income and assets test interactions with superannuation savings which is described in Appendix A. The model teases out the impact on combined Age Pension and superannuation income of a range of possible superannuation savings levels attained at retirement, between age 65 and 74. For compressed exposition, our charts show just the case of a couple who are home owners. The underlying model and its data, which is archived and available on request from the authors, also generates results for single retiree home owners, and for singles and couples who are not home owners. As shown in Chart 2 illustrating Age Pension eligibility under Simplified Superannuation but with September 2016 pension values, a couple’s full aged pension of $34,477 is received up to super savings of $250,000 (case 3). Then the income deemed from superannuation savings triggers the income test to reduce the part pension (case 4). For superannuation savings of $350,000 upwards, the assets test becomes binding to continue gradually reducing the part Age Pension (case 5) until it is completely withdrawn by super savings of $1,200,000 (case 22). The key point to note is that for every $50,000 step up in super savings, the withdrawal rate of the part pension was deliberately calibrated to ensure the saver received some increase in combined income from super savings and the remaining part pension. There was no disincentive to save more, nor any incentive to dissipate existing savings in order to draw a larger Age Pension. 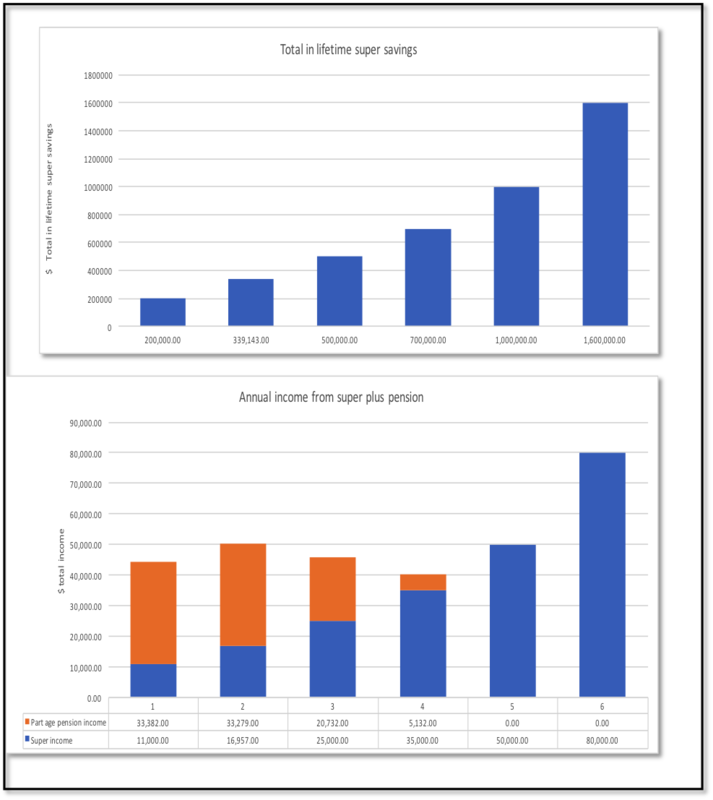 The effective marginal tax rate on the income from additional superannuation saving between $400,000 and $1,150,000 was almost 80% — obviously very high, but an inevitable compromise in moving from full to no Age Pension without continuing, fiscally costly access to the part Age Pension at excessively high income levels. Note: see Appendix A for assumptions and source. 5. How was Simplified Superannuation working? Some recent commentary suggests that Australia’s pre-2017 Age Pension and superannuation policies, however simple and attractive, were a policy luxury for a fiscally lucky Howard/Costello government, when budgets were somehow in surpluses approaching 2% of GDP. But the generosity of the earlier Coalition government is now said to be unaffordable after 10 years of budget deficits, and with deficits stretching ahead for at least several years more. More specifically, Simplified Superannuation is claimed by its critics to have left the overall structure of superannuation tax treatment excessively costly to revenue (measured by one version of Treasury’s Tax Expenditure Statement), excessively favourable to the rich, and to be ‘fiscally unsustainable’ over time. Those three criticisms are each heavily contested. Full discussion of the debate is beyond the space available in this article, but we point interested readers towards thoughtful analysis by tax and superannuation authorities such as Ken Henry, Robert Carling and Jeremy Cooper. Save Our Super has itself summarised many of these arguments in a submission on the 2017 superannuation changes. Theory aside, the main reason for the 2017 changes in retirement income policy seems to have been a hunger for government revenue within the four year forward estimates horizon of the budget papers. We note in passing that the budget has not been pushed into deficit by retirement income policy that was set a decade ago, was shown to be sustainable, and has been largely stable since. Rather, budget deficits arose from discretionary expenditure growth in the global financial crisis that is not yet reversed, and weak revenue growth. Simon Cowan and Michael Potter have shown that Australian fiscal deficits and debt are driven from ratcheting up public expenditure, with tax increases following to partly finance higher spending levels. After revision of the Simplified Superannuation measures following consultation, Treasury estimated the measures would cost $7.2 billion in 2006 dollars over the years 2006-07 to 2009-2010. It is clear from the publications cited below that these cost estimates were well-vetted and modelled within Treasury, well-documented and publicly contestable. We have no reason to believe the initial costs of the reforms were significantly different from the amounts documented (and budgeted for) at implementation. But the important issue for changes in retirement income policy is not the costs of such changes over 4 years, but rather their impact over 40 or more years. It is the long-term effects of the changed incentives on savings and work over a 40 or more year career, and on Age Pension dependence over a 30 or more year retirement, that allow judgement of whether the measures will have their intended effects on increasing workforce participation of older workers, increasing retirement living standards and improving fiscal sustainability by reducing demands on the Age Pension compared to what it would otherwise have been. Fortunately, the evolution of the retirement income system up to the 2017 changes has been extensively modelled. Since the mid 1990s, Treasury maintained a specialist retirement and income modelling unit to analyse tax, pension and super policy changes, and to assist distributional analysis and intergenerational modelling over the necessary lengthy time frames. That work used a model known as RIMGROUP.RIMGROUP is a comprehensive cohort projection model of the Australian population which starts with population and labour force models, tracks the accumulation of superannuation in a specified set of account types, estimates non-superannuation savings, and calculates tax liabilities, social security payments including pensions and the generation of other retirement incomes. In 2012, Treasury updated RIMGROUP modelling based on the 2007 Simplified Superannuation Age Pension and superannuation changes and incorporating other significant retirement policy changes up to 2012. They also factored in the future increases in the Superannuation Guarantee rate scheduled out to 2025. The key projected trends are shown in Chart 3. One element of Chart 3 has been widely mentioned, including by Jeremy Cooper and the Shepherd Review’s Statement of National Challenges: the very small projected rise over 42 years in the proportion of those who, while eligible by age for the pension, instead wholly self-finance their retirement. Interpolating approximate numbers from Chart 3, it appears the rise is from about 18% to 21%. On the face of it, that is disappointing. Some who have commented on Chart 3 have used it to argue that Australia’s retirement income system, as revised by Simplified Superannuation, was underperforming relative to the costs of the Age Pension and the superannuation tax concessions. But the second major trend in Chart 3, little remarked upon, is that the proportion receiving the full Age Pension was projected on the foundation of Simplified Superannuation to halve to about 30% of the retired population by the late 2040s, and the proportion receiving only a part Age Pension would double to almost 50%. To underscore the point: overall reliance on some Age Pension declines only slightly, but reliance on the full Age Pension declines massively. This is surely a notable policy success attributable largely to the incentives of Simplified Superannuation, both in terms of limiting the growing fiscal cost of the Age Pension and increasing personal choice, accountability and reward for those who choose, and are able, to save more to support their own preferred retirement living standards. Source: Rothman. G. P., Modelling the Sustainability of Australia’s Retirement Income System, July 2012. It is instructive to examine why the decline in reliance on at least some Age Pension is so slow. If a retired couple who might, before Simplified Superannuation, have received a full Age Pension were to forgo the Age Pension and instead wholly self-finance their retirement, what would that require? They would have to save to build lifetime savings in superannuation of over $1 million (on top of other assets such as their residence, car etc). Realistically, such saving takes decades, if not a full working career. If the retired couple save strongly in superannuation but fall appreciably short of the $1 million target over their remaining working years, what would happen? They would receive some part Age Pension, instead of the full pension. What would happen if, having retired without need for an Age Pension, the couple’s growing life expectancy, or a downturn on their superannuation fund earnings, led over time to the depletion or exhaustion of their superannuation savings? They would quite properly revert in advanced age to reliance on a part or ultimately a full Age Pension, helping to limit overall growth of totally self-funded retirement. The Simplified Superannuation changes of 2007 obviously affected all ages, between early-career workers with 40 or more years of saving to reach retirement, through those too close to retirement to much increase their lifetime savings, to those already retired. The biggest impact on lifetime saving obviously occurs with those furthest from retirement. So the policy effects of Simplified Superannuation (and of the Superannuation Guarantee increases) take decades to build up as the system matures. People can’t jump instantly from full Age Pension to full self-financing no matter what the incentives, but need to build up lifetime savings to a high level to achieve self-financing. During the transition period, the most one can expect is to see the proportion receiving a full Age Pension falling and the proportion receiving a part Age Pension rising, exactly as projected in Chart 3. 6. How will the 2017 Age Pension and superannuation changes work? The 2017 assets test reverts from the Costello Simplified Superannuation reform that applied from 20 September 2007 to the earlier, steeper taper that applied before 2007. (See Charts 4 and 5 below; Chart 4, showing illustrative superannuation balances on retirement, is like Chart 1 but has five fewer cases of high superannuation saving balances, because the harsher taper on the assets test phases out the part Age Pension at lower levels.) The measure was introduced in the 2015 Budget by Joe Hockey, but Scott Morrison was the Social Services Minster at that time, and had a key role in explaining the changes. According to one newspaper report: Mr Morrison said the changes to achieve a “more sustainable pension” restores the $3 taper rates changed by the Howard government in 2007 when the budget was in surplus. “Those levels of taper rate changes from 2007 when it was reduced from $3 to $1.50 are no longer affordable,” he said. … “Welfare is for need. Superannuation requires incentive,” Mr Morrison said…. Single people who lose their pensions will need to draw down about 1.8 per cent on their additional assets to maintain their current income level. Couples will need to draw down 1.76 per cent. As shown in Chart 5, the 2017 Age Pension income test works to trim access to the full Age Pension from case 4, corresponding to a super balance of $300,000. Combined income from a part Age Pension plus superannuation nevertheless continues to rise to a local maximum of $52,395 per annum for a super balance of $400,000 (case 6). Beyond case 6, the 2017 assets test becomes binding (case 7) and continues to withdraw the part aged pension much more steeply than before — so steeply, in fact, that total pension and superannuation income now commences falling, even as the illustrative superannuation balances rise in $50,000 increments to $800,000 (case 14). To double superannuation savings from $400,000 to $800,000 attracts an effective marginal tax rate on income from that saving of over 150%. The part Age Pension is completely removed at a superannuation balance of $850,000 in case 15, and total income, now exclusively from superannuation, begins to rise again. But it does not exceed the earlier local maximum income of $52,395 until an illustrative superannuation balance of $1,050,000 (case 19) and an income of $52,500. Note how close this superannuation balance is to the estimated actuarial value of the Age Pension to a married couple. Between superannuation balances of $400,000 and $800,000, an effective marginal tax rate on income from extra savings of over 150% means that if someone has committed $20 extra to superannuation when working, and on retirement draws $1 of income from that saving, their combined Age Pension plus superannuation income falls by almost $0.60, compared to if they had simply spent the $20 when they earnt it and drawn a larger Age Pension in retirement. Those incentives can’t be sustainable. The extremely high effective marginal tax rates pictured in Chart 5 might not matter much in practice if they only occurred over a small range in which there weren’t many savers. But in reality, they matter a lot: Chart 5 shows a very wide savings trap of $650,000. 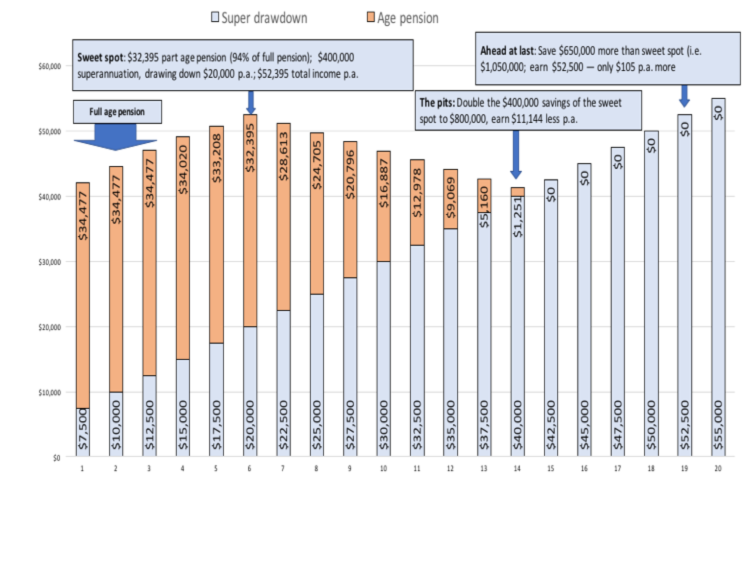 The bottom of the trap is close to where the balances of many male super savers are now finishing up in their peak saving years (Table 1 below shows the projection for the fifth decile), and the top of the trap is close to the actuarial value of over $1 million of the full Age Pension for a married couple. The government has created, presumably accidentally, a wide savings trap precisely where all the ‘retirement income savings action’ has to be, if people are to save more to reduce reliance on the Age Pension and to increase their retirement living standards. Note: Deciles are constructed by ranking individuals from poorest to richest, and dividing into 10 equal groups, each with 10% of the population. The first decile contains the poorest 10%, the second decile the second poorest 10%, and so on until the tenth decile, containing the richest 10%. So superannuation savers in the fifth decile shown above are richer than the poorest 40% of the population, but poorer than the richest 50% of the population. Supporters of the sharper 2017 taper in the Age Pension assets test suggest that the 2007 assets test was unfair: they argue no one who owns a home and has a $1 million in superannuation or other assessable assets should be receiving a part Age Pension. But to argue in this way is both unrealistic, and manifests a one-dimensional conception of fairness, which is viewed exclusively as taking from the richer to give to the poorer. It is unrealistic because its consequence — high withdrawal rates of the Age Pension — is perverse incentives. While fairness is of course subjective, most would agree that is not fair that people who forgo consumption and save more to increase their living standards in retirement and reduce their reliance on an Age Pension should instead get less retirement income. This is the perverse outcome for a large range of savings under the 2017 assets test. Balancing those two ideas of fairness — redistribution form rich to poor and recognising that extra saving will only occur if it gains some reward, rather than punishment — takes thought, close research and long-term modelling, to devise a workable system which lessens reliance on the Age Pension over time and does not discourage higher savings. the unprecedented $1.6m transfer balance cap. These measures from the 2016 Budget interact (whether intentionally or otherwise) with the Age Pension assets test restriction in the 2015 Budget. The 2015 Budget created the savings trap pictured in Chart 5. The 2016 Budget created restrictions that hinder superannuation savers from overcoming the savings trap, and that increase the probability that they will never escape from the trap. The width of the savings trap is $650,000, the difference between case 6 and case 19 in charts 4 and 5. To traverse the savings trap by non-concessional contributions under the old limit of $180,000 per annum would have taken 3.6 years — a very high rate of saving that very few could sustain. Under the new $100,000 limit taking effect on 1 July 2017, it would take 80% longer, or 6.5 years. To traverse the savings trap by concessional contributions under the old limit of $30,000 per annum would have taken 21.7 years — a high rate of saving that very few could sustain. Under the new limit of $25,000 taking effect on 1 July 2017, it would take 20% longer, or 26 years. The abolition of the previous higher $35,000 cap for those over 50 is another subtle message to all superannuation savers: the current Coalition government is not bound by previous notions of grandfathering adverse change for those too close to retirement to be able to change their saving plans. The obstruction to super saving imposed by the complex transfer balance cap is more opaque, but possibly more threatening over time. As Trish Power from SuperGuide has documented, the operation of the transfer balance is ridiculously complicated, with its supporting paraphernalia of Personal Transfer Balance Caps, Transfer Balance Accounts, Total Superannuation Balance Rules, First Year Cap Spaces, Crystallised Reduction Amounts, Excess Transfer Balance Earnings and Excess Transfer Balance Taxes.Moving beyond July 2017, most retirees will now need to monitor two lifetime superannuation amounts – their transfer balance cap, and their transfer balance account. The new policy applies to both existing and new super pension accounts from 1 July 2017, which effectively means the policy will apply retrospectively. Again quoting Trish Power from this same SuperGuide article:The fact that the Coalition doesn’t state the numbers of Australians immediately affected by this policy, and doesn’t state the hundreds of thousands of Australians who will be affected by this cap over the next 25 to 30 years is misleading. Add the millions of Australian retirees who will now need to monitor their transfer balance cap (for periodic indexed increases of the cap), and the same millions who will also need to monitor their transfer balance account for new money going into retirement phase, or existing money being removed from retirement phase (commuting pensions into lump sums), and the claim of less than 1% of fund members being affected is text-book propaganda. The government has just made retirement a lot more complicated for all Australians, including those Australians with nowhere near $1.6 million in super.As super balances increase, and the cost of a reasonable lifestyle in retirement increases, the $1.6 million cap (indexed for inflation in $100,000 increments), will be potentially within the reach of a hefty percentage of middle-aged and younger Australians currently in the workforce. Not only will millions of retirees have two life-time amounts that they may need to be mindful of, but an increasing number of older Australians will have to monitor these figures for the rest of their lives. As Save Our Super has argued in a submission to the Senate Committee examining the superannuation legislation, there can be no doubt the 2016 superannuation re-complication has more than undone the simplification benefits of the 2006 proposals in Simplified Superannuation. The net effect of the transfer balance cap paraphernalia is again a clear message to superannuation savers: a well-researched, carefully thought-through set of transparent and well-costed and modelled reforms to influence savings for a lifetime has been reversed in just ten years. In superannuation, good policy can be driven out by bad policy, through the heat of a feverish election campaign, with poorly specified tax grabs on savers from three major parties competing to bamboozle electors, or perhaps just to assure them that spending bribes will be paid for, if at all, by someone else. Looking at the 2015 and 2016 measures from the perspective of their joint application in 2017, the policies look like a perfectly malevolent scheme to lock savers into the ‘sweet spot’ of permanent dependence on a part Age Pension only 6% below the full Age Pension, superannuation savings self-limited to $400,000, and any other saved funds placed either in assets that are outside the Age Pension assets test (for example, a more valuable residence, kitchen and bathroom renovations) or consumed. It may be objected to the analysis behind Charts 2 and 5 that it is unfair to the case for saving beyond $400,000 in superannuation, because someone who retires with a large superannuation balance doesn’t have to live only on the income from superannuation savings. They could also, as they age, gradually draw down the principal too, by reducing their account balances. In reality, Charts 2 and 5 are already set in a legislative environment of increasing drawdown of superannuation capital, as the legislated minimum drawdown rate escalates with age from 4% (age 55 to 64) to 14% (95 or older) which is designed to limit use of allocated pensions for estate planning. The 5% drawdown rate at age 65 to 74 illustrated in Chart 5 would already involve some drawdown of capital in current market conditions, if we consider an assumed 2% real return over the recent rates of inflation of 1.0% – 2.0%. We can also examine the consequences of a faster than legislated drawdown of superannuation principal in the context of the steeper Age Pension assets test taper on assumptions detailed in Appendix A. If superannuation drawdown occurs at the rate necessary to support the same total income (superannuation plus any part or full Age Pension) as the maximum total income enjoyed by anyone with a lower or the same superannuation balance, those savers in the ‘savings trap’ illustrated in Chart 5 have to deplete their savings earlier. Note: see Appendix A for assumptions. So from a retirement policy perspective, proposing that savers with superannuation balances already in the ‘savings trap’ draw down their superannuation principal to match the ‘sweet spot’ income is not a ‘free lunch’. It merely ensures the perverse incentives of the 2017 assets test lead to such savers returning up to 7 years sooner to draw a larger (or ultimately a full) Age Pension. Any short-term apparent gains to the budget are followed by long-term costs. Of course, drawing down superannuation at an accelerated annual rate for as long as possible is only one way to maintain the income of the ‘sweet spot’ of case 6. Perhaps more likely is that the superannuation would not be spent annually to maintain income for as long as possible, but instead withdrawn in a lump sum to finance ‘bucket list’ travel, home renovations, or a more valuable principal residence. With wealth moved out of superannuation saving in this way, annual income would be topped up to the case 6 level by increased access to a fuller Age Pension. Looking first at the Age Pension assets test change, it has marooned with significantly reduced living standards a generation of Age Pensioners who worked, saved and retired on the basis of the Simplified Superannuation changes. If the government was attracted to the 2017 Age Pension change, it should have included appropriate grandfathering provisions by preserving the 2007 arrangements for those already retired. The Coalition government has never explained the 2017 reversal of policy, beyond saying the government needed the revenue, and that it was ‘unfair’ for people who own a house and have generous other assets (up to $1.2 million, as shown in Charts 1 and 2) to access a part pension. The government has merely sent the sound reasoning and evidence behind 2007’s Simplified Superannuation reform to the forgettery. This policy change goes beyond a commonplace government breach of faith. It is more like fiscal entrapment. In 2007, the then Coalition government said, in effect: “Here are our carefully designed and tested rules, enshrined in law; you can retire at 65 with specified access to the part Age Pension.” In 2017, the later Coalition government said, in effect: “Fooled you! You’re now 75 and out of the workforce, and here is the reduction in retirement living standards the government prescribes for the rest of your life.” People don’t take kindly to being treated this way, and a lesson painfully learned is not readily forgotten: never again trust a government making rules for retirement income. Turning now to the superannuation changes, their consequences will impact on all three ‘superannuation generations’: the retired 60 pluses; the peak saving 40 to 60 year olds; and the 20-40 year old young savers, who are mostly making only superannuation guarantee contributions at this stage of their lives. Retirees, or those nearing retirement, with super balances already in the savings trap zone will have strong incentives to reduce balances to increase income by qualifying for a higher part Age Pension. Most likely, their savings will be diverted to a more valuable principal residence, renovations, consumption (such as ‘bucket list’ travel) or gifts (below Age Pension limits). These strategies are widely advertised in retirement media and financial adviser circles. When a government vastly complicates retirement rules as it has done in 2017, savers and retirees are forced back into the arms of expensive financial advisers, who would be remiss in their professional duties if they did not point out to savers and retirees how to ‘hit the sweet spot’ and maximise their Age Pension entitlements. 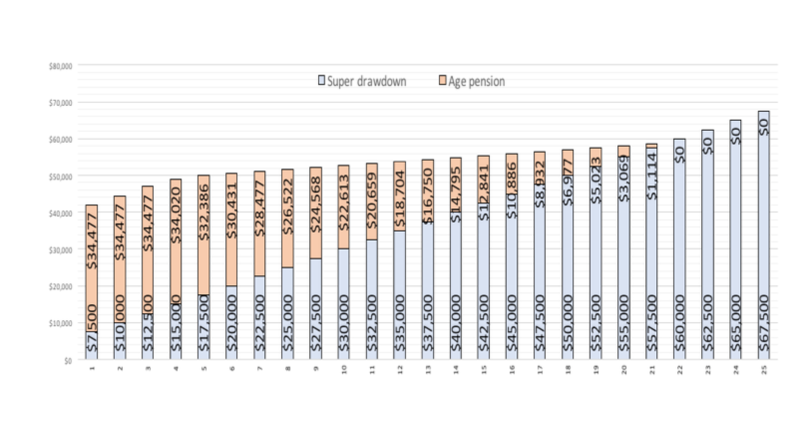 If those with super balances in the savings trap zone instead try by faster drawdown of their super to match the higher income of those successfully accessing a higher part Age Pension, their savings will be exhausted sooner and they will progress to reliance on a bigger (or full) Age Pension earlier than otherwise (Chart 6). Those in the 40 to 60 year peak saving period will have strong incentives to spend more current income and save less into super, with that extra spending being either consumption, or spending on durables such as housing and renovations not disadvantaged by the tax system and outside the Age Pension assets test. Young savers will review the shambles of the retirement income policy changes in 2015 and 2016, and coast on their super guarantee compulsory minimum savings and either spend according to the incentives provided by the income tax and the Age Pension, or save outside of superannuation in areas of lesser income tax disadvantage, such as negatively geared property. The government’s imagined short-term gain to revenue will most likely be reduced in the short run, and reversed in the long run. In particular, the 2016 Budget estimate of revenue from the 1 July 2017 superannuation measures will be undershot as people adjust to the savings trap by reducing discretionary superannuation saving effort, and/or moving their superannuation within couples to gain protection from the Budget measures. There seems little doubt these behavioural adjustments will invalidate the old RIMGROUP projections of Chart 3. The rapid, smooth progression from full to part Age Pension projected earlier, will slow or halt, and the rise (if any) in full retirement self-sufficiency will be even smaller. 8. Where’s the modelling for the 2017 Age Pension and superannuation changes? The analysis in this article is simple, dealing mostly with the short-run income and behavioural impacts of the perverse, interactive incentives structures enacted separately, and perhaps accidentally, in the 2015 and 2016 Budgets by two different neophyte Treasurers. As the 2012 RIMGROUP modelling of Chart 3 reminds us, understanding retirement income policy changes demands long-term projections that account for: demographic ageing; the rise in superannuation guarantee rates; the interaction of pension eligibility rules with superannuation rules; the growth in incomes; greater life expectancies at retirement; and the consequences of ultimate recourse to the Age Pension once super savings crimped by the 2017 measures are exhausted. It is striking that the Coalition government’s presentation of, and advocacy for, its 2017 changes, while running to many dozens of glossy pages, has nowhere published any new long-term modelling to update the RIMGROUP 2012 projections on the sustainability of the retirement income system. That earlier modelling is now most certainly invalidated by the policy changes that took effect in 2017. To have made the retirement policy changes announced in the 2015 and 2016 Budgets without any published modelling of their long-term effects was to fly blind. It further damages the credibility of the changes themselves, and increases taxpayer concerns that future changes will be necessary, but may be similarly opaque in their justification and evidence, and equally vulnerable to reversal or further change. In the meantime, our simpler analysis from first principles suggests the retirement income picture is now much less robust and sustainable than after Simplified Superannuation was implemented in 2007. Retirement living standards are unlikely to be as secure, fiscal improvements are highly questionable, confidence in retirement income policy making has been destroyed, and in the newly destabilised retirement income policy system, further unpredictable policy changes are likely budget by budget. Only a decade ago, Australia was lauded among the advanced economies for the quality of its public policy processes. Good policy processes can’t absolutely guarantee good policies, but they make good outcomes most likely. Any policy mistakes are relatively few, quick to identify and more easily corrected before vast sums are wasted. More recently, long-standing observers of Australian policy such as Paul Kelly have observed that public policy processes have fallen into disrepair. Good policies may occasionally accidentally emerge from bad processes, but the probability is that bad ideas will be implemented because of poor analysis, lack of a strategic view of the ‘big picture’, lack of publicly available information, and lack of contestable modelling. Not only are bad policies more likely to be advanced in such an impoverished environment, their detection and the prompt limitation of their damage are more difficult. For recent examples, think of the NBN (famously advocated to Prime Minister Rudd on the basis of a sketch on a napkin, rather than a social cost-benefit analysis, as satirised here). Think also of Australian renewable energy policies, and the desperate scramble now to limit their damage, well sketched by the former Productivity Commission Chairman and Chair of ANZSOG, Gary Banks. An equally gruesome case to be played out over decades to come is the very expensive construction of a uniquely modified submarine design. As we have seen, the 2017 changes to Age Pension and superannuation arrangements fall solidly into this regrettable policy morass. Save Our Super has argued in its submissions to Treasury on exposure drafts of the superannuation Bills and to the government and the Senate Committee on the Bills that the changes were not supported by evidence or modelling, but were rationalised by unjustified insults to savers who had lawfully followed Parliament’s legislated incentives. The consultation processes were derisory and rushed, and warnings by specialists such as the Institute of Public Accountants and the Australian Institute of Superannuation Trustees of excessive complexity and unresolved problems were clearly not incorporated into revised legislation. With all the desiderata for good policy making in a complex area met by a Coalition government in 2007 but violated by a later Coalition government in the 2017 retirement income policy changes, there is little wonder the results are unjust, unstable, unsustainable and likely to necessitate still more changes. The retirement income system now struggles to meet the complications and perverse incentives introduced in 2017, and must address serious damage to confidence in superannuation and Age Pension rule-making from the Coalition government’s failure to include appropriate grandfathering provisions. Yet the government continues to load the system with new challenges and expectations, all of which rest on the very confidence that has been recently trashed. Consider superannuation incentives such as creating deferred income products or assisting saving for a first home. If citizens can’t trust the government to respect obligations to those who entrusted their lifetime savings or retirement income to yesterday’s laws, why should they allocate additional savings for a decade or more hence on the basis of today’s laws? The 2016 election saw the Liberals, Labor and the Greens in a chaotic and poorly documented competition to raise more tax from superannuation, which does not augur well for future policy making in this most complex policy area, where mistakes have long-lasting consequences. The retirement income incentives taking effect in 2017 are unsustainable, unstable, and will need further extensive and better-designed change in the near future. The necessity for further change is itself a disincentive to current super saving and an encouragement to ‘age-pension-first’ strategies. The damage to confidence from the 2017 changes is amplified because their implementation violates a 40-year tradition of including appropriate grandfathering provisions against any significantly adverse policy change to protect those already retired or too close to retirement to make alternative saving arrangements. Savers now rationally fear that future, presently unforeseeable changes necessitated by the design failures of the 2017 changes might also be implemented without grandfathering. Key directions for future change remain open for considered national debate. Widely different and sometimes contradictory options are commonly advocated for increasing self-funded retirement and ensuring the Age Pension serves as a safety net for those who cannot self-provide rather than, as at present, a foundation and first resort for individual retirement planning. abandoning superannuation altogether and moving to a national pension scheme, with all that that implies for a socialisation of the retirement income savings sector and creating an enlarged vulnerability to the recent practices of napkin-based, ‘nation-building infrastructure investments’, in which ‘good debt’ is incurred to pump water uphill and other notions yet to be turned into concepts, and later into ideas. It is only necessary to list such widely different options to see how unsettling they will be to many already retired, to those nearing retirement, and even to young savers compulsorily committed through the superannuation guarantee to the super system. So the analysis of such ideas, the marshalling of evidence on how they might apply, and a long-term model of what their true impact on retirement incomes and the national budget will be, has to be a foundation to any informed national discussion and choice of a path forward. Such an improved base in public information, analysis and modelling is essential, not just to inform voters, savers and retirees, but also to bring along the opposition and cross-bench parties and independents in an area that is otherwise very vulnerable to panic-mongering.Save Our Super has no position at present on these or other future retirement income options. But we are convinced the failures of the 2017 changes mean more policy change is inevitable. Better options with lower adjustment costs will emerge, the sooner recent policy mistakes are acknowledged. The next round of reforms must be better considered than the perverse 2017 changes. Any significantly adverse impacts on those already retired or too close to retirement to change their plans should include appropriate grandfathering provisions. Otherwise, necessary, well-informed debate will not get off the ground. The charts are based on a model created by Sean Corbett, B. Comm. (UQ), B.A. Hons in Economics (Cambridge), M.A. (Cambridge). Sean has over 20 years of experience in the Australian superannuation industry, principally in the areas of product management and product development. He has worked at Challenger and Colonial Life, Connelly Temple (the second provider of allocated pensions in Australia) and Oasis Asset Management. The model captures the key interactions between the superannuation system and the Age Pension under its income and assets tests. It uses illustrative superannuation balances of between $150,000 and $1,500,000, and allows exploration of total incomes enjoyed with various superannuation balances by retirees who are either single or part of a couple, either with or without home ownership. It also allows alternative assumptions about the net real earning rate of superannuation balances, to estimate how long various superannuation balances will last in retirement. The model is archived and available on request from the authors, who thank Sean for his permission to draw on his work, and for his helpful comments on drafts of this article. 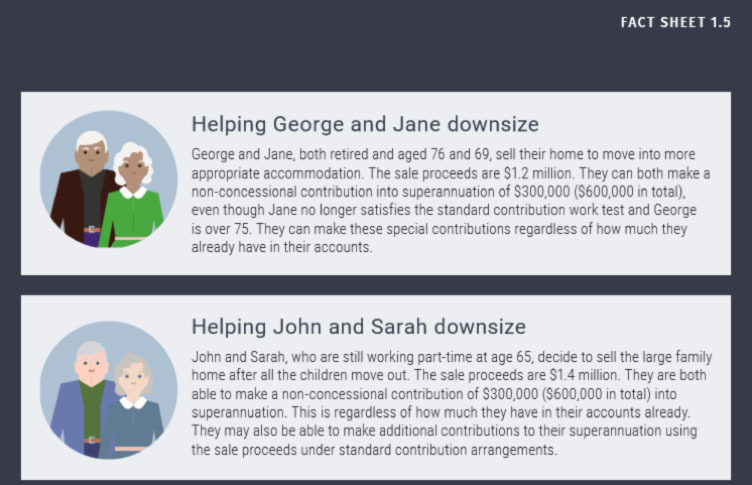 The model appears identical in broad approach to the articles by Tony Negline, with slightly different assumptions – for example Negline assumes the married couple have $50,000 in personal use assets (which reduces the headroom under the assets test for superannuation saving), whereas Corbett doesn’t assume any assets subject to assets test except the superannuation balance itself. The Corbett approach illustrates a more continuous array of illustrative savings levels than the Negline articles, to give a more fine-grained picture of likely incentives for adjustment. Charts 1 and 4 are simply hypothetical illustrative superannuation balances at retirement age of 65 for a couple. For simplicity in exposition, Charts 2 and 5 present the impact of those illustrative superannuation balances on a couple assumed to own their own home.Their superannuation balance is assumed to be invested in an allocated pension (by far the most popular retirement income product available for superannuation). They are assumed to draw down that pension in an income stream at a rate of 5% a year (this is the minimum required draw-down for someone in the 65-74 age bracket, so the examples in the charts could be interpreted as applying to a couple anywhere in that age range).For purposes of the Age Pension’s income and assets tests, it is assumed the deemed income from the superannuation balance applies and that the couple has no other assets except their superannuation in excess of the assets test limits. For Chart 6, the superannuation balance is assumed to earn 2% more than the rate of inflation. Terrence O’Brien: Terrence O’Brien is a retired senior Commonwealth public servant. He is an honours graduate in economics from the University of Queensland, and has a master of economics from the Australian National University. He worked from the early 1970s in many areas of the Treasury, including taxation policy, fiscal policy and international economic issues. His most senior positions have also included several years in the Office of National Assessments, as senior resident economic representative of Australia at the Organisation for Economic Cooperation and Development, as Alternate Executive Director on the Boards of the World Bank Group, and at the Productivity Commission. Would you buy a deferred superannuation income stream from these people? On 16 March 2017, Kelly O’Dwyer, Minster for Revenue and Financial Services, released draft superannuation income stream regulations and a draft explanatory statement for public consultation. She said “The regulations are intended to cover a range of innovative income stream products including deferred products, investment-linked pensions and annuities and group self-annuitised products.” Click here for Kelly O’Dwyer’s media release. On 21 March 2017, Treasury invited Save Our Super to provide a submission to Treasury on the Treasury Laws Amendment (Innovative Superannuation income Streams) Regulations 2017. Click here to see the Treasury Invitation for submission. However, last October Save Our Super advised Treasury its view on the proposed “innovative income stream products”. In short, why would anyone buy a deferred annuity that would not start payment until a quarter-century in the future? That would merely provide the next 8 governments with 25 years in which to withdraw the new tax concession with ‘effective retrospectivity’. “In a world where the Government is withdrawing with ‘effective retrospectivity’ the earnings tax exemption on assets already lawfully saved over a lifetime, and destroying a tax-free annuity under existing law to those already retired, why would anyone buy a deferred annuity that would not start payment until a quarter-century in the future? That would merely provide the next 8 governments with 25 years in which to withdraw the new tax concession with ‘effective retrospectivity’. When a future government withdraws without grandfathering the ‘deferred pension’ concession of 2017, they could cite the precedent of the Turnbull/Morrison Budget of May 2016; they could say that the super concessions were too expensive, too unfair and unsustainable; argue that 95% or 99% of people would not be adversely affected; and that the only losers were already very old, wouldn’t need much money at that stage of life, and could access the age pension if they needed to. This problem underlines a dilemma created by the Budget measures. The Government can only offer facilitating a decrease in longevity risk at the same time as it has increased the regulatory risk of future ‘effectively retrospective’ law changes. The net effect is zero, or worse. Click here for the submission (see section 15). We encourage you to make a submission to Treasury – particularly if you support Save Our Super’s view. Submissions close on 12 April 2017. We, and many other Australians, should not forget 23 November 2016. We have named that day “Superannuation Betrayal Day”. On that day, the Coalition Government with the support of Labor, rushed two of its three superannuation Bills through Parliament. Those Bills were assented to on 29 November 2016 and are now law: click Superannuation ( Excess Transfer Balance Tax) Imposition Act 2016 (C’th) (No 80 of 2016) and Treasury Laws Amendment (Fair and Sustainable Superannuation) Act 2016 ) (C’th) (No 81 of 2016). The third superannuation Bill, the Superannuation (Objective) Bill 2016 (“Objective Bill”), was referred to the Senate Economics Legislation Committee. On 30 December 2016 Save Our Super lodged a joint submission with that Committee. Click here to see the submission. the Superannuation ( Excess Transfer Balance Tax) Imposition Act 2016 (C’th) (No 80 of 2016) and the Treasury Laws Amendment (Fair and Sustainable Superannuation) Act 2016 ) (C’th) (No 81 of 2016). These two Acts are subsequently referred to as the 2016 Acts. The Objective Bill, has been referred to the Senate Economics Legislation Committee to report to the Senate by 14 February 2017. It is perverse for the Senate Committee on Economics Legislation and Parliament to be considering the Objective Bill a few months after the hurried passage of the 2016 Acts, which were allegedly shaped by it. The 2016 Acts implement the largest super changes in a decade. The changes reverse strategic direction from the 2006-07 simplification exercise, massively re-complicate the superannuation framework, penalize high superannuation balances and hinder accumulating large savings in superannuation. They also create new, costly super incentives of debatable worth. The Objective Bill is only partly a backward-looking rationalisation of the 2016 Acts. It is also intended to provide a stable, confidence-building, legislatively-secure framework to reassure savers about how future superannuation policy changes will be formulated. The Objective Bill’s stated primary objective, “to provide income in retirement to substitute or supplement the Age Pension”, is fatally flawed, and incapable of helping discriminate between good and bad policies. Our submission of 17 November 2016 4 to this Committee’s earlier Inquiry into what are now the 2016 Acts, explained why the super changes were bad policy. The five subordinate super objectives (created by regulation under the Objective Bill) make matters worse, as the six objectives taken together will often be in conflict among themselves. The Objective Bill offers no guide on how to resolve conflicts or trade-offs between objectives. For example, the 2016 Acts hugely re-complicate super taxation (in contradiction of subordinate objective (5) that favours simplicity, efficiency and safeguards for savers). It takes Treasurer Morrison and Minister O’Dwyer about 90% more verbiage to explain the re-complication of the taxation of retirement income than it took Treasurer Costello to explain simplification of the status quo ante, and the 2016 Acts require consequential change in at least 16 other Acts. 5 But that complexity is apparently outweighed by allegedly alleviating fiscal pressures on Government (subordinate objective (4)). So it seems for the Government, more revenue from super within the forward estimates period trumps all other considerations, whatever the longer-term damage to the retirement income framework or the budget implications beyond the forward estimates. The primary objective lacks a clear recognition of the moral and economic imperatives for more Australians to enjoy higher, self-supported retirement living standards, and for fewer to be dependent on Australia’s biggest ‘unfunded defined benefit scheme’, the age pension. As other submissions to this Inquiry show, the primary objective is widely opposed by many thoughtful and professionally well-informed critics, but the Government has ignored their criticisms. It has used the old bureaucratic ploy of claiming there was no spontaneous consensus for any one alternative to its own approach, so the Government will plough ahead with its own original preference. But a fatally flawed and heavily contested objective cannot be an anchor for good policy. As the Tax Institute has noted in its submission to this Inquiry, legislating a bad objective is more likely to further reduce trust in the future of superannuation than increase it. It is ever-clearer why the Government has proceeded with this Objective Bill and the 2016 Acts that it claims the objectives rationalise: its erroneous belief that more revenue can be extracted from super savers within the forward estimates period, without adverse consequences showing up within that period for trust and certainty in super, for retirement living standards, and for public expenditure on the age pension. They are all problems kicked down the road for another government. But it is not too late to draw back and think again. On the hurried consultation with Treasury on the second tranche release of exposure drafts, industry groups and professionals such as the Australian Institute of Superannuation Trustees, the Tax Institute and the Association of Superannuation Funds of Australia have submitted that it will be very costly and difficult, if not impossible, for the complex new measures to be implemented by the start-up date of 1 July 2017. The Government has been formally advised that some key back office developments in super funds and the ATO necessary for implementing the complex new concepts and rules of the Government measures are more likely to take 2 years to implement than the available 6 months. 8 Equally, it will probably not be feasible for super savers to obtain the necessary specialist advice in time to modify their own arrangements. The Government should make a virtue out of the inevitable delay, and properly re-consider the many submissions critical of the measures it received during its rushed consultations. It is not too late to include appropriate grandfathering provisions in the 2016 super measures, to minimize damage to trust and certainty in super. The Government should maintain the sound grandfathering policy practice of at least the last forty years 9 : policy changes adverse to super saving should only be applied prospectively in accord with the Asprey principles (summarised again at Box 2 on page 18). Click here to see the full Senate Committee Report. The enactment of the current legislation is not the end of the story. There are a lot of angry and dismayed Australians who continue to feel betrayed by the Coalition and Labor. They are very unhappy with the super changes and are not remaining silent. A number have already contacted us to voice their disgust with the Government’s conduct. Save Our Super has commenced planning for its continuing campaign. Save Our Super is not going into retirement! On 17 November 2016 Save Our Super lodged its joint submission with the Senate Committee, as did a number of our supporters. You can find Save Our Super’s joint submission here. On 22 November 2016 both Bills passed the House of Representatives, unamended. On the same day, 23 November 2016, The Australian published the Australian Prudential Regulation Authority’s (“APRA”) super data for the September quarter 2016, which APRA had released the previous day (on Tuesday 22 November 2016); Michael Roddan’s article, “Super doubts drain $1.5bn out of system”, The Australian, Wednesday, 23 November 2016, page 19 can be found here. “Thank you, everyone, for that warm welcome — it’s wonderful to be with you for the Superannuation Opportunity Forum. Today is an opportunity for reflection. Superannuation, as most of you know, is a two-trillion dollar — and growing — industry.” The speech can be found here. In fact, as the APRA data suggests, it is not growing; it is a shrinking industry. The only thing that is now likely to grow are the number of superannuation financial advisers and their fees! Save Our Super has argued that it is necessary to grandfather the measures in the Budget that reduce the living standards of those already retired and restrict the savings efforts of those too close to retirement to change their life saving plans. Grandfathering is necessary to preserve trust in super and in government rule-making approaches to super saving. A destruction of trust in super would damage the budget rather than improve it, because it would reduce net super saving and increase reliance over time on the aged pension. Before the Government had drafted its legislation, we presented those arguments in more general terms to you and Coalition MPs in Terrence O’Brien’s e-mails of 8 and 19 September 2016 and our joint e-mails of 18 and 24 October 2016 . After the introduction by Treasurer Morrison on 9 November 2016 of the Bills and an Explanatory Memorandum for the super measures, the public has been given just four working days to make submissions on the Bills to the Senate Economics Legislation Committee. The Committee in turn has been given four working days to report on the measures. It is already apparent from 125 public submissions to Treasury on three earlier tranches of exposure drafts that there are serious conceptual and practical problems with the approach in the Bills that add to our concerns about the destruction of trust in super and super rule-making. Such a decline was easily understood: the Greens and Labor had been promising significantly to increase tax on super since March and April 2015, respectively. The Coalition proposed in effect tripling the Labor tax increases in the 3 May 2016 Budget, providing cover for Labor then to triple its original tax grab. So super savers and self-funded retirees knew by May that their retirement living standards from super savings were sure to decline whatever the election result in early July, and through chaotic policy processes likely to lead to further tax raids in future. So they commenced rebalancing their lifetime saving plans away from super in the June quarter 2016. We predicted that when the September quarter’s data become available in November, capturing a full three months of savers’ reaction to the new super landscape and the election outcome, they would confirm and extend the contraction apparent in the June quarter. With yesterday’s release of APRA data to end September 2016, the decline in personal contributions has accelerated as we predicted to almost 30%, September quarter 2016 on previous September quarter (or 17% year to September 2016 over previous year to September). As we argue at pages 14-15 of the attached submission, these accelerating declines in personal contributions suggest the net effect of the Government proposals will be to reduce savings in super over time, and increase retirees’ reliance on a blend of lower super balances and a part age pension. Savers’ confidence in super is being destroyed, and the net adverse impact of retirement income policy on the budget will gradually worsen. This has the makings of a slow-motion retirement income policy catastrophe, about which the Government has been abundantly forewarned. Our attached submission argues that the Senate Committee should take more time through public hearings to examine the implementation of the budget proposals, which are radical reversals of super tax strategy that damage savers’ confidence that their life savings will be governed by predictable, intelligible rules. To date, Save Our Super has not received any response to that email. The Federal Coalition Government has made a number of changes to its Budget 2016 superannuation proposals. Consequently, Save Our Super has updated its earlier email petition/s to take into account those changes. Thank you if you signed the earlier petition/s. Please support, or continue to support, Save Our Super by completing our updated petition here.